A first-ever study of air trapped in the deep snowpack of Greenland shows that atmospheric levels of carbon monoxide (CO) in the 1950s were actually slightly higher than what we have today. This is a surprise because current computer models predict much higher CO concentrations over Greenland today than in 1950. Now it appears the opposite is in fact true. In a paper recently published in the journal Atmospheric Chemistry and Physics, Vasilii Petrenko, an assistant professor of earth and environmental sciences, concluded that CO levels rose slightly from 1950 until the 1970s, then declined strongly to present-day values. This finding contradicts computer models that had calculated a 40 percent overall increase in CO levels over the same period. Carbon monoxide, a byproduct of combustion that can be deadly in high concentrations, exists in the atmosphere at very low levels. While not a greenhouse gas like carbon dioxide, it plays an important role in atmospheric chemistry and an indirect role in global warming. Petrenko and his team began their research project by extracting air from the snowpack at various depths, with samples taken from deeper in the snowpack corresponding to older time frames. After analyzing the samples, they created a CO history for the Arctic over the last 60 years, which shows that levels have been declining since the 1970s, despite a global increase in the number of vehicles being driven. Carbon monoxide readily reacts with hydroxyl molecules (OH), thereby reducing the levels of OH in the atmosphere. The problem is that OH helps to reduce the amount of important atmospheric greenhouse gases�such as methane. This means that high concentrations of CO indirectly contribute to global warming. Petrenko said it's possible that improvements in combustion technology may have had an even stronger impact than is immediately apparent from his research data. He points out that burning firewood�a predominant cooking fuel in south Asia�is a major source of carbon monoxide. Improvements in combustion technology may have masked an increase in CO from cooking�brought on by a rise in that region's population. "In order for computer models to get things right, it's important to have accurate historical records," said Petrenko. "Until now, we haven't had enough reliable data on carbon monoxide concentrations. This work helps to fill that gap." 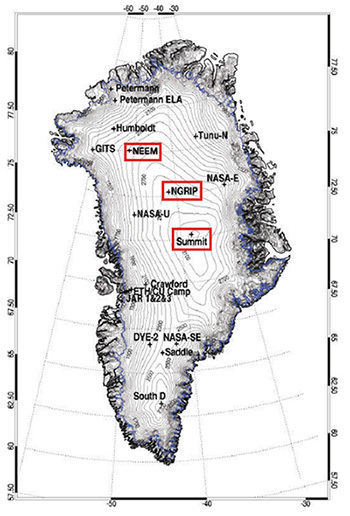 Petrenko hopes to get the necessary funding to take readings from deeper in the Greenland ice in order to extend the record of CO levels to before the Industrial Revolution.